Close to 80,000 Instagram users can identify Nguan’s images in an instant. They subscribe to his daily feed of silenced, tranquil, pastel-hued snapshots of architecture and faces in bustling cities like a shot of Redhill MRT station, or a beautifully-composed landscape picture of Bugis Village's spiral staircases spawned — images that generate thousands of likes and comments on Instagram. Yet for all the hype surrounding the photographs, few – almost none – know who the man behind them is. Nguan is elusive and anonymous — a mysterious figure with nothing more than an unassuming handle @_nguan_ as a clue to his identity. Much like Banksy, he’s managed the seemingly impossible task of avoiding the limelight or any form of attention, and steering clear of cameras. Google and social media don’t even have a single image of his face. It was clear to me that tracking him down was going to be a tall order. A gouache illustration of Nguan. But, in a rather anticlimactic turn of events, I found his email address on his website, shot him a message, and before I knew it, had arranged for a coffee meet up in Everton Park. "How do you know that I am Nguan?” the man opposite me smirked. “I might have been sent by him. Maybe I'm his brother?” he laughs. Considering how his statement could very well be true, I gave him a cursory once-over. He stood tall, about 185 centimetres in height. He sported a neat crop of black hair, cleanly shaven by the sides and backcombed. He had an oval-shaped face with untrimmed eyebrows and bumpy cheeks. He looked like an average Joe, and nothing like the arty hipster that I had imagined Nguan to be. Nevertheless, I had no doubt the man I was talking to was indeed Nguan — he was enjoying his anonymity and the confusion it brought far too much to be an impersonator. "A picture from my 'Coney Island' series that is an example of my attempts to organise chaos – not necessarily to make a scene more peaceful, but to give it structure," explains Nguan. “Do you enjoy being anonymous?” I ask. Nguan thinks he has an idea of how the mystery started out. “It probably started because I came out of nowhere. I came back to Singapore – began uploading my work of Singapore around 2011. And people just thought, 'Where did he come from?' It's a country where everyone knows [everyone else]. You will be able to track the progress of artists from the very beginning, but I popped out of nowhere." An image taken in Tokyo's busy Shibuya crossing. Nguan has been photographing for the past 14 years ever since graduating from Northwestern University in Illinois, where he majored in film and video production. "I bought a small camera and started taking pictures of people and things I saw, as a way of making notes for screenplays that I intended to write," he had previously said. "Instead, I realised that the isolated fragments of time that I gleaned for my photographs were interesting in their own right..."
Shot of a building in Bukit Batok, circa 2005 that Nguan was fond of. " 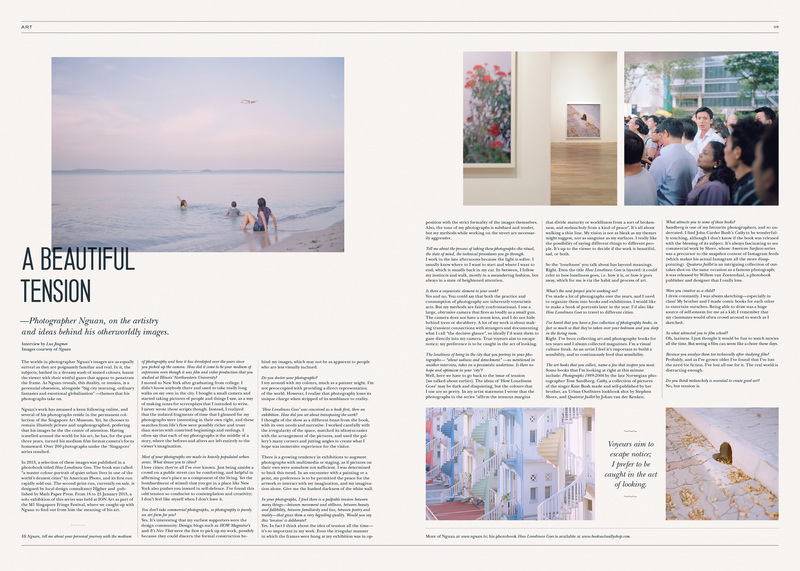 I found the colours really interesting, and these two photos were important reference points for me when I was conceiving my later 'Singapore' work, which attempts to reimagine the country as a dream landscape," he quips. He fears that being recognised would inadvertently mean that his subjects would become aware of who is photographing them and, in turn, behave in a way that goes against the untouched, uninterrupted snapshots of quotidian life that his photography stands for. “Will you make yourself known to your fans and the public?" I ask him. "I will eventually show up at something," he quips. Nguan is already taking steps and making the effort to show up at his exhibitions. In April, he showed up at a solo exhibition of his latest publication, How Loneliness Goes, held at the FOST Gallery in Gillman Barracks. Find Nguan's work on his website or Instagram. His latest book, How Loneliness Goes, is available at Books Actually.